While the NSA would have us believe that their extra-constitutional collection of information is excusable because it is necessary for the purpose of national security, it appears that they have used their surveillance network for at least one non-security project. This expansion of the NSA’s program to a non-security application is a perfect example of ‘mission creep” and a major blow to the claim by the government that they should be allowed to infringe upon our privacy in the name of security. As I previously mentioned, numerous federal agencies would love to get their hands on the NSA’s trove of digital information; given the available evidence, it appears that at least one such agency—the Drug Enforcement Agency—has been given some access to the NSA’s information. According to reporting by Reuters, a special division within the DEA called the “Special Operations Division” has been given access to NSA data on Americans. This division uses their access to the NSA’s data bank to help them make drug cases which would otherwise be impossible to make. None of these cases involve terrorism or are matters of national security—they are merely standard drug cases. 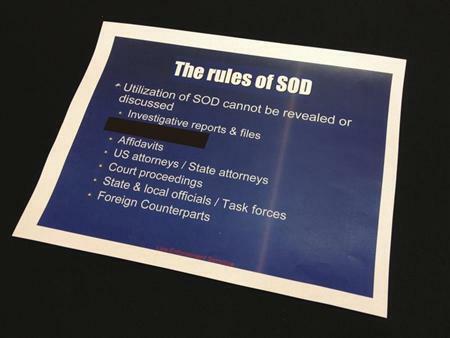 Put plainly, the Special Operations Division of the DEA side-steps the 4th Amendment by piggy-backing their operations on a secret intelligence program. They gain access to illegally-obtained information which they could never get a legitimate warrant for, then build their case backwards in a way which look legitimate. 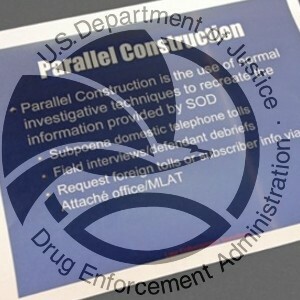 Through a legally and constitutionally questionable process called “parallel construction,” federal law enforcement conceals the source of their information once the case goes to trial. Rather than admit that the information was hoovered by the NSA and passed on, the DEA takes what it receives from the NSA and reverse-engineers it in a way which looks legitimate. Here is an example of this process: An NSA wiretap discovers that somebody is planning on moving drugs in a truck and they pass this on to the DEA. Once the DEA locates the truck which is being used to carry the drugs, they compel the local police to find a reason to stop the truck (ex. a broken tail-light) with the expectation that the truck will be searched for drugs. Once the truck is searched and the driver is arrested, the official party line of law enforcement becomes simply that the truck was stopped randomly, thus concealing the fact that the police used illegally-obtained information to know exactly where to look. The process of parallel construction misleads everybody involved with trials, including the prosecutors, defense attorneys and judges. This lack of transparency in the sources of information during investigations is a violation of the 6th Amendment right of a defendant to confront their accusers. In addition to this program’s violation of the 6th Amendment, the seizure of information by the NSA in the first place is certainly a 4th Amendment violation and the process of parallel construction is arguably a 5th Amendment violation (if the grand jury is misled into handing down an indictment). When we take all of these violations as a whole, we are left at the conclusion that they entire DEA program is terribly unconstitutional. I could not agree more with Gertner. Once you remove the veil of national security from these programs, you are left with federal agencies illegally collecting information on Americans and “phonying up” a paper trail in order to trick people into thinking that they got the information legitimately. At best, this is an example of a law enforcement agency letting their zealous pursuit of lawbreakers overshadow their constitutional limitations; at worst, this is an example of a spying apparatus gone amok, only to metastasize and corrupt an entire division of a federal law enforcement agency. I just had one question/point of clarification. Perhaps I am playing devil’s advocate on a minor point. You mentioned that the DEA could use private information to stop a truck–that they “knew” contained drugs–on other grounds, i.e. a broken tail light. Assuming they did find drugs, and this became a drug bust, who would dispute the efficacy of the system in protecting us? Of course, this assumes that the “war on drugs” is legitimate (which I wouldn’t necessarily agree with). Everyone would feel that, if they aren’t doing anything wrong, they have nothing to hide. I know this argument doesn’t hold up to scrutiny either. Would you mind giving an example of something where this would target an truly innocent citizen, just to illustrate the possible misuses of the program? First of all, the fact that somebody is breaking the law does nothing to mitigate the violation of their privacy which the DEA/NSA is committing. In issues of constitutional protections, the ends do not justify the means (for example: if you were to throw out the 8th Amendment and start torturing, you could force confessions out of many suspected criminals–some of them might even be guilty) and you cannot justify violations simply because they reach the conclusion that criminals are sent to jail. As to your request for examples of innocent people who may be targeted: Journalists, political activists, ex-spouses, political candidates, celebrities, people who cut off the wrong NSA/DEA analyst in traffic, etc. Everybody has embarrassing and private things which could damage their image–the creep of the NSA’s program represents the ability of those with power in the government or enough money to influence analysts to spy in on anybody who irritates them. In fact, Eliot Spitzer is a perfect example of this kind of targeting. Because he fought the banks and tried to increase regulations on their actions, the banks spied in upon his funds and hired private investigators to gather additional damaging information. This investigation by the banks eventually led to his shaming and resignation when his fondness for prostitutes came out in the public (at BU, my poli-sci teacher coined a term for this type of scandal where a political individual is forced to resign in disgrace due to hypocrisy: to “spitzerize” oneself). Spitzer was targeted by the banks, which have relatively little access to information–so you can imagine what could happen if the NSA decided to smear somebody (like Hoover tried to do with MLK). That said, all of this is academic and rhetorical, as the NSA’s program is unconstitutional, even if it is only used on people who are breaking the law. I like “hoovering” the information..a new verb?